Remove fat from beef. Cut beef into 3/4-inch cubes. 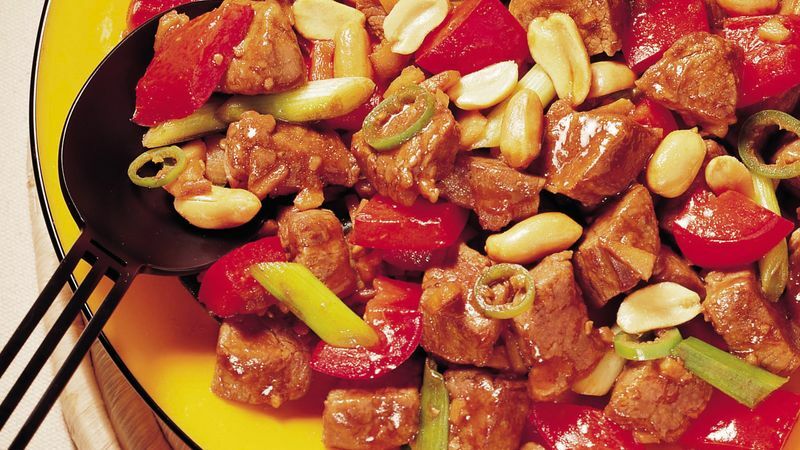 Toss beef, 1 teaspoon oil, the cornstarch and white pepper in medium glass or plastic bowl. Cover and refrigerate 30 minutes. Heat wok or 12-inch skillet over high heat. Add 1 tablespoon of the 2 tablespoons oil; rotate wok to coat side. Add beef; stir-fry about 2 minutes or until beef is brown. Remove beef from wok. Add remaining 1 tablespoon oil; rotate wok to coat side. Add chilies, onions, bell pepper, garlic, gingerroot, brown sauce, bamboo shoots and sugar; stir fry 1 minute. Add beef; heat through. Sprinkle with peanuts. Hot stuff! Wear rubber or plastic gloves when seeding and slicing chili peppers to protect your skin from the oils that naturally occur in chilies. Bored with plain white rice? Serve this stir-fry over brown rice or couscous.